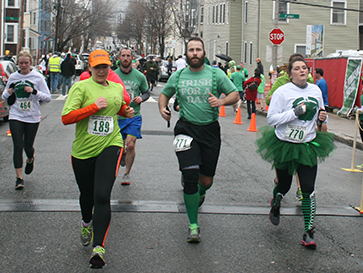 The St. Patrick’s Day Road Race benefits the Edgerley Family South Boston Club’s Keystone Teen Leadership Program. Thank you for helping our kids by running with us in 2019. You honored us with your presence. 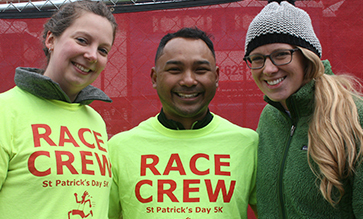 Check back in December for registration for 2020’s St. Patrick’s Day Road Race! – Teens 13 and older are allowed to run only with written parent permission and waiver. – Children under 13 must be accompanied by a parent/adult guardian the entire route, and waiver must be completed. – No pets or strollers. Parking is always an adventure in Southie, especially on St. Patricks Day, but the area around West 1st Street / East 1st Street / D Street / E Street has options. Additionally, Comcast has helped us secure 50 parking spots in the building they lease at 426 East First Street. The Edgerley Family South Boston Club is a 10-minute walk from Andrew or Broadway Stations on the Red Line. From Andrew Station, walk up Dorchester Street to West 6th Street (take a left). From Broadway Station, walk up W. Broadway to F Street (take a right). The #11 Bus stops in front of the Club, but its route will be diverted as race time approaches. The 5K Race starts and ends at the Edgerley Family South Boston Club, located at 230 West 6th Street. The route goes down East Broadway, around Farragut Statue (at the beach), returns back up East Broadway to West Broadway, left on E Street, left on West 6th Street to the finish. There is a slight hill in front of the Club, and two decent hills on East Broadway (each of which you run twice). The course is not certified and in some cases may be a few yards shy of 5K. Foot Race origins are with the South Boston Boys Club (as it was then known). The first race corresponded with the opening of the new Clubhouse on W. 6th Street in 1940. The Linehan Twins were the Race Directors in the early days. In the late ’70s the South Boston Rotary managed the race for a while. In the early ’80s Old Harbor AC took it over re-instituted it, built it up, and passed it on to the South Boston Boys & Girls Club as a fundraiser, returning it to its original owner. City Councilor Bill Linehan was the race director for OHAC, and then as a Club Advisory Board member, merged the two. In the ’80s the race started and finished at Broadway Station. In 1992 Boston hosted the IAAF World Cross Country Championships at Franklin Park and the New Zealand team had an impressive showing at the St. Patrick’s Day Race. Or was it the Canadians? Not sure, but they sure were fast. In March 1994 the Race moved to its current location at the Edgerley Family South Boston Club. In 2008 the Race honored Club Alumnus Father Lane who had recently passed away. 2010 was the Big Rain Race, with a Nor’easter throwing over three inches of rain and 30 MPH winds in South Boston. Undeterred, 805 hardy souls completed the race. In 2011 a record 1,730 finishers blessed us with their presence. The Race honored Club Alumnus Tommy Butler who passed away 16 days earlier. In 2012 1,725 people finished the sold-out race on the sunny and exceptionally warm day. The Edgerley Family South Boston Club-member rock band, The Harmaniacs, performed and Boston Bruins forward, Gregory Campbell, was the Official Race Starter. Four days after a blizzard, in breezy and chilly conditions, 1,150 runners competed and showed great spirit. Hayley Sutter of Lincoln NE/Brighton MA defended her 2016 title and also set a new modern era female course record. The Connolly Medal is given to the first South Boston resident to finish the St. Patrick’s Day Road Race. It is named for James Brendan Connolly, a son of South Boston, who medaled in the 1896 Olympics in Athens and is considered the first modern Olympic champion. Clifford Jewelers kindly donates the medal each year. There is a statue of him at Moakley Park in South Boston. The Father Lane Medal is awarded each year to the first place Edgerley Family South Boston Club Kid Finisher. There is no doubt about it: volunteers make our race great! Many of our teens, staff, parents and alumni volunteer at our race. Please consider joining them! We need volunteers for a variety of roles. We especially welcome groups. Please contact our Race Director, Harry, with questions or to sign-up: hduvall@bgcb.org. Thank you to everyone who participated! We look forward to seeing you next year. Rosie Donegan of Brighton MA set a new female course record at 16 minutes and 13 seconds!